But when I checked it with a loupe it turned out a bit more suspicious. My plant book suggests it could be either scale insects or what I think you in English call just "edema" or "oedema", because small wounds have formed which when healing cause corky stuff (in my country it is called "cork disease"), and that the edema can be caused either by bugs (e g different kinds of mites or thrips) or physiologically. I've been trying to identify what it is and I wonder if anyone with experience of these diseases or this palm can say what you think. The spots you see are from 0.2x0.2 to 0,3x2 mm but they are also on the petiole to the right and of those a few are 0.5x1 and 2x2 mm, several are ~1x1mm and most are smaller. 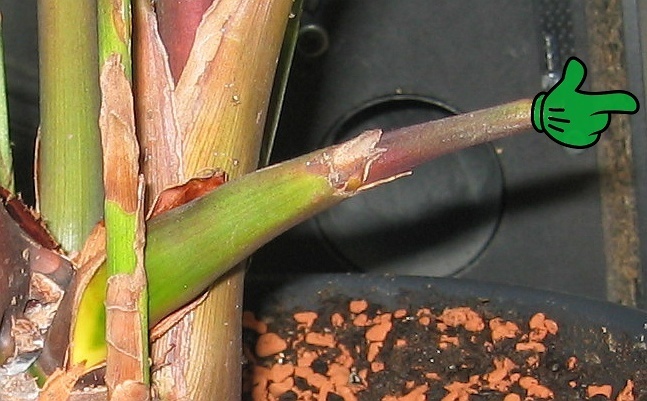 Mostly placed just above where the thinner part of the petiole starts but a few higher up too, and if oblong then always in the direction of the veins. The brown stuff in itself is flat, sometimes it feels like it is slightly recessed but just as often it feels completely flat and many of the ones to the right are elevated, or maybe rather flat corky stuff on top of elevated tissue. If I scratch with a wooden stick I can often peel the elevated ones off but not the sunken ones, and underneath it is red or beige so there is no damage under the whole spot but maybe a small crack, it is hard to see for sure. I'm thinking it is probably not mites or thrips since the leaves are perfectly green, and it should grow slow but grows very well, and also younger parts should be affected too. Also can't see any bugs (though I know mites can be down to 0.2mm and thrips can hide). 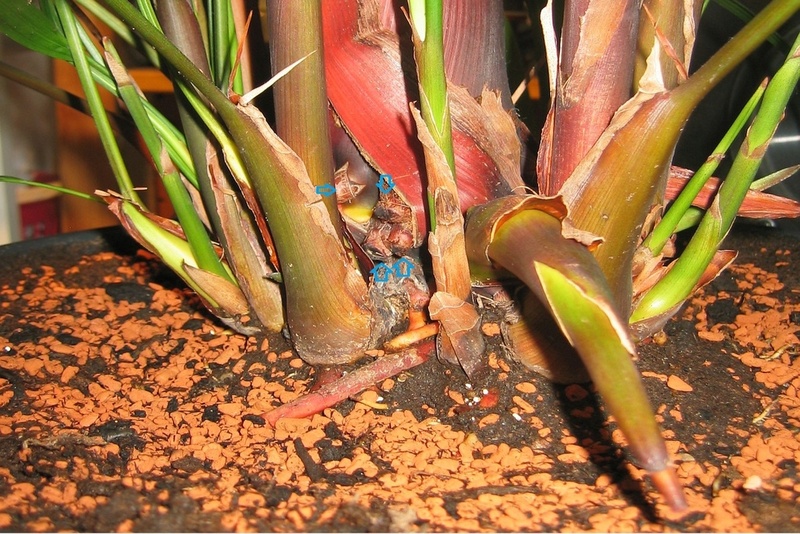 Thrips should also cause pale lines (on undersides of leaves) and black poop stains less than 1mm big. And there is no sticky stuff (honeydew) that I can see and the spots are sometimes "merged" and really look more like part of the plant tissue than a shield and not at all uniform so I think it is probably not scale insects. So I'm thinking it is most likely physiological. 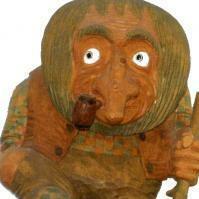 Being only on older parts and the different shapes fits the symptoms. I read that it should then also be on the underside of leaves but I don't know if that is always true. These edema are caused by water pressure being too high inside the plant, which can be caused by a combination of much water in soil, high humidity and low light (and too much fertilizer for slow-growing plants). 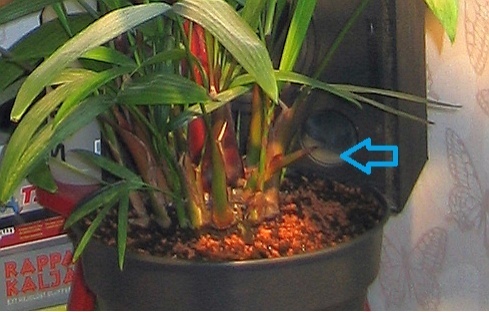 I have a humidifier which automatically switches on at 41%RH and off at maybe 50%RH but it has rarely been active since summer (maybe 1% of the time) and the vapor has been directed away from the stem (but may well hit some leaves). I use ceramic metal halide spots at the ceiling which give most parts of most leaves 1.5 to 3klx (plus that it is next to a window but it is winter now so not much sun). Fertilizer is liquid at every watering and at half the recommended dose for all my palms and it grows a lot. I leached it on the 30th of Dec which was a bit later than I planned (previous leaching was 5 months earlier). I check soil moisture level before watering and it normally varies from 10-11 when newly watered down to mostly around 4-5 when time to water it (but a bit uneven, maybe 3-6). But there is one thing I think might be a cause for very local high soil moisture level: I have tried out self-watering the last 5 months, which entails 2 wicks at opposite sides and 2 jars of fertilized water under it. I've tested a number of wicking materials and these are very efficient compared to all others I tried and able to supply several times more water than it consumes but still don't manage to keep the whole pot moist enough (which I assume must be due to too poor pull within pot) so I still have to water it about every 3 days. It is a bit rootbound but not much, I can poke the moisture meter almost anywhere without almost any resistance. So I'm hoping terminating the self-watering experiment will do the trick but I'm still a bit worried. What do you think? Nothing to worry about. 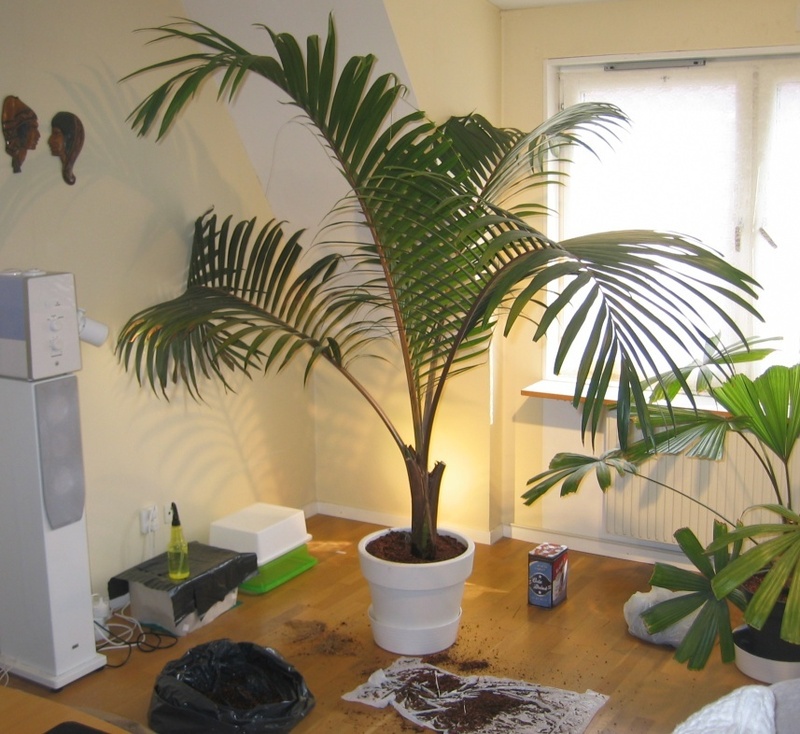 Probably related to this palm not being a good long-term subject for indoor cultivation. Yours looks fine for now. I would not expect too much from it...this is a full blown lowland TRF palm and will suddenly not like its conditions in a major way sometime down the road. One is dusting. I admit I don't believe dusting has such a big impact as many seem to think and it is well protected from outside dust most of the time and I can't imagine things like pieces of cloth or hair to cause problems, but I can imagine smaller and stickier particles to matter, like small pieces of human skin and whatnot. I found this article which says fine-particle dust can clog stomata so that they remain open if they were open when dust came but it can't really clog them to stay shut. But then I found this article which says dust can clog stomata so that they get plugged (but only if open when dust comes). So I will dust them carefully with a wet soft cloth (tricky to avoid removing wax while still getting in contact with the whole corrugated surface). There are examples of big leaves which haven't been dusted in 2½ years which are perfectly green so I don't expect this to be a major cause but can imagine it can contribute. The other one I just thought of is low humidity. My book warns for the situation well known from greenhouses that if plants have high humidity and wet soil they may not be able to push the water out through the stomata which causes edema. But I'm thinking of the opposite: An associate professor (focused on soil, and not interested in palms much, but still) told me plants in general close their stomata if humidity is <40%RH. The obvious reason to keep humidity up is that leaves might dry out but another one is that with stomata closed there is no photosynthesis and the plant (or at least the leaf) will slowly die (takes months). 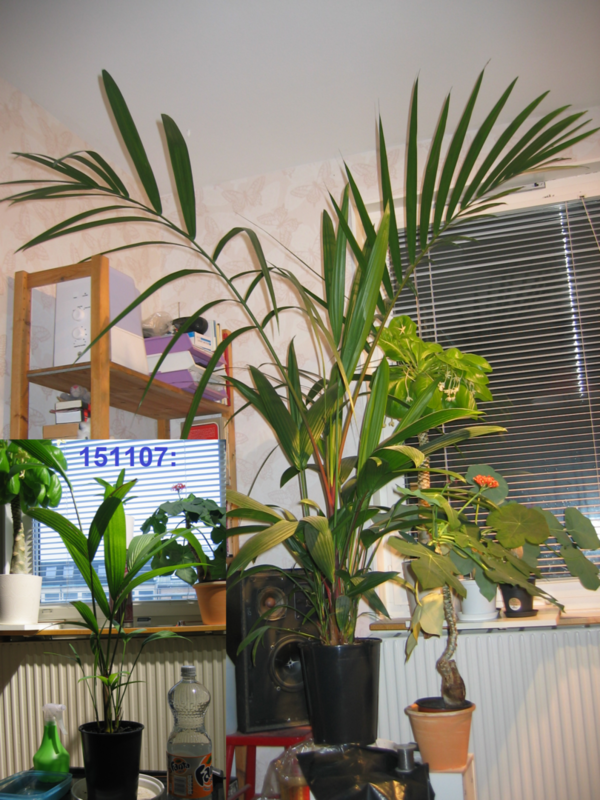 I have the humidity strategy of boiling water every morning to reach 60% (just before that I aerate properly) and let this slowly decline so that I have >50% for seberal hours, and also I have 2 humidifiers with hygrostats which in one room regulates between 45 and 50% but in this room 40 to ~50%. I have bought a better hygrostat and I think properly placed I can make it regulate to 45-50%. Stomata is an area in need of much research. I mean sure there have been some research (I skipped through a book titled Stomata by Willmer & Fricker full of such research) but still they don't even know if plants actually care about the parameter we call relative humidity, another theory is that they sense "water vapour saturation deficit". The book teaches interesting stuff like that almost all trees have stomata only on the back side of the leaves, placement and pattern of stomata differs between species, some can adapt their stomata in several ways (like oil palms), and a couple of other sources say that e g Coconut palms close their stomata if <60%RH and e g alocasias can't close their stomata at all. And it is hard to find useful detailed info. If I compare to light illumination requirements I have been able to find lists of light preferences for a great number of palms and other plants (even in the unit lux), but regarding stomata and the connected humidity needs I have never seen any such list just occasional rare examples like the ones I mentioned. I'm sure it is because professional growers have this covered by having massive humidifiers so it's only a problem for the end customers like me and you but we are not worth the research it is better if the plants die so that we buy more.. I'm also thinking it should probably be ok if I peel the dots off if they are easy to peel with e g a wooden stick? I think it's similar to "scab crust" on a human. Very interesting! David, you say the pic of the smaller plant is from November 5th? Is that Nov. 5th of 2017?! OH! Sorry, you did mention that lol Great growing!! They do that, its nothing to worry about. Thanks Scott, that's a big relief to hear. And the spots haven't become worse since January. I had to water every 3 days though plus I got nervous by some unevenness of moisture and almost instantly reaching low moisture levels which I think was due to abundance of roots quickly sucking soil dry and adding to percentage of non-peat. Now that I have ~2cm soil all around the whole root ball remains moist considerably longer. It kept on growing after repotting, but then I only added soil around the old root ball (but 40% seramis instead of the 30% sand before). This is one of few plants I still keep in a peat mix. It seems to have no problem with it, it drains really quickly, I think maybe the roots are good at penetrating and at filling the soil volume creating a texture so that it makes its own aeration passages. Maybe next year I feel I should replace the soil mix and if so probably use one with intrinsically better drainage. Makes me quite nervous though, I heard how it hates dry roots, I misted the root ball every minute it was out in the air. Does anyone know what this is supposed to become? It has about 16 small stems already (besides the main stem) but they so far have always started out green and pointing upwards, and new roots come now and then but they tend to go rather straight downwards. But this? It even looks "telescopic" with something emerging in the middle. Is it a way to spread in a weed-like fashion to take over a whole garden? Is it hoping to find a new pot? Or trying to get feet and run away? Maybe the world's biggest aerial root? Or trying to become more human and reaching out to shake my hand? I thought "clustering" (with "suckers") meant just a big number of local stems, not aerial ofshoots? I know strawberries do that but palms? And if it is an offshoot why does it go clearly above ground? 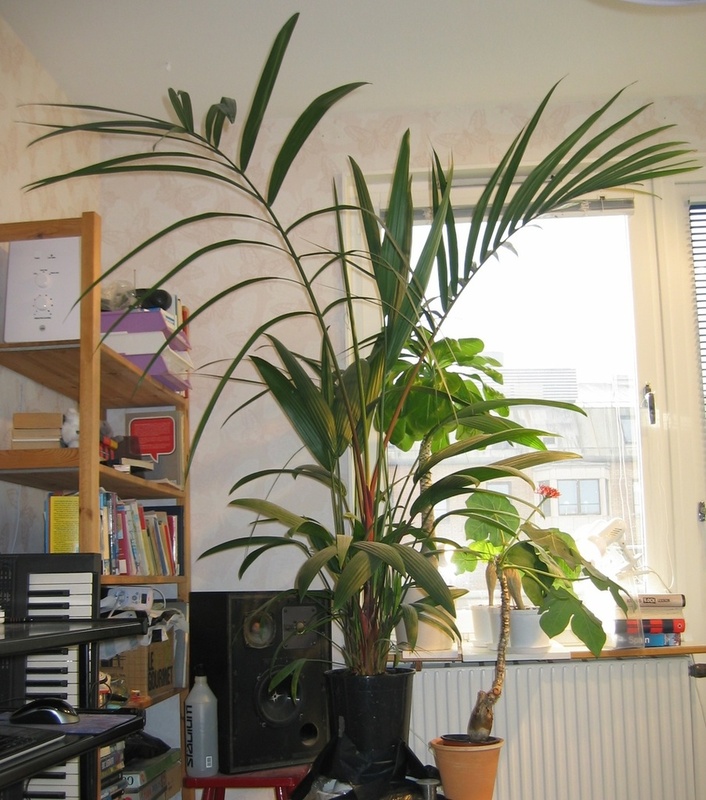 If I place a pot filled with soil next to it, will I have one more palm growing in the other pot soon? And can I eventually cut the shoot off and have two separate palms? Googling it I find that "Chamaedorea Stolonifera" (the "Stolon Palm") propagates in an invasive way by underground branches called stolons. Sounds like clustering but with a wider range. And mine is clearly above ground. David, I think that you did the right thing with the bigger pot. The people who have a lot of success with smaller pots usually have solitary palms in them. And fuss over them. I think that your plant that size does need a greater water reserve. Unlike my Licuala Ramsayi which also is in the same 11L pot but where I have problems that could be mainly because pot is too big, although not really too big because there are roots throughout and it would require very frequent watering if smaller pot, but I think most likely roots are sparse and from what I read in this forum it would probably have preferred a smaller pot (it would prefer to be outdoors in the ground in a different country but if it gets to choose between big & small pot..). You can see half of it above. I'm giving it some special treatment right now, hope it responds. But the Lipstick doesn't seem to mind the present pot size, it never ever had a frond turn yellow except one a month ago but I think it was about time, it does have a lot of fronds considering the size of the pot. I repot mainly because I'd like to water less often and since I feel sure it has filled the pot with roots now (I can tell by using moisture meter). But the Lipstick has been behaving perfectly pot-wise. 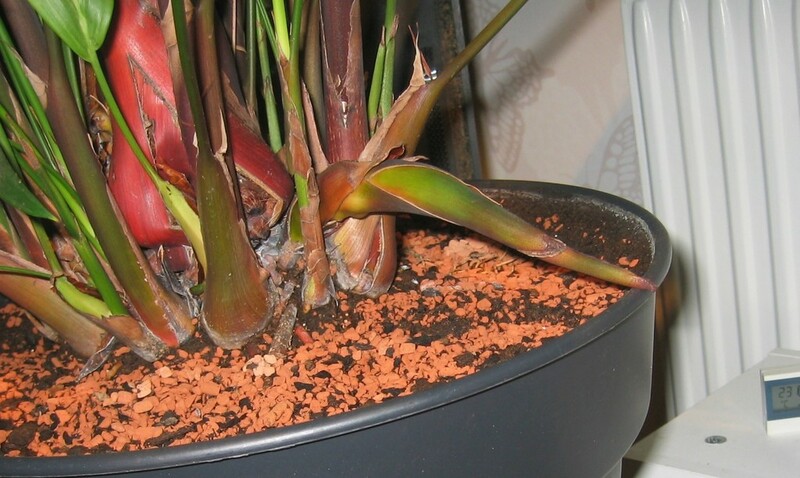 When the Baueri's roots emerge both under and over the pot and ignore what people call "air pruning" (just keeps growing, soil or air, it grows anyway) and the Ramsayi's roots have no plans to come out of the pot and are having a hard time filling the present pot, the Lipstick has a very clear tendency to grow to the drainage holes then stop there, and some turn and go up the sides a bit, so that in total it uses the soil volume it has in a very efficient way. It has a peat mix which drains very well, I'm sure thanks to the root system having created a net throughout. Most leaves are all green, some leaves are partially pale but seem to stay that way. Ashamed to admit I missed watering by 1 day once last month so that soil became very dry for about a day but it caused no harm. Hope I will never cause dry soil again, but the idea to keep water in the saucer for Lipsticks, altough maybe fine, is not a requirement, it is perfectly happy with normal watering, i e water when slightly moist. Meanwhile, does nobody have any ideas about "the hand" of whatever it is in the 1st pic from Saturday? If not a hand or foot and not an antennae then what? "The Hand" is probably a foot.. I mean a root. 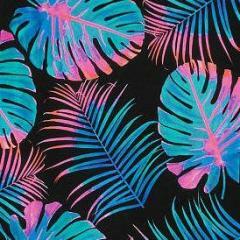 Has anyone seen or heard of such roots, for the Lipstick or any other palm? It is like a telescopic antenna, adding section by section. It is a rhizome, trying to find some space for its own. Maybe. 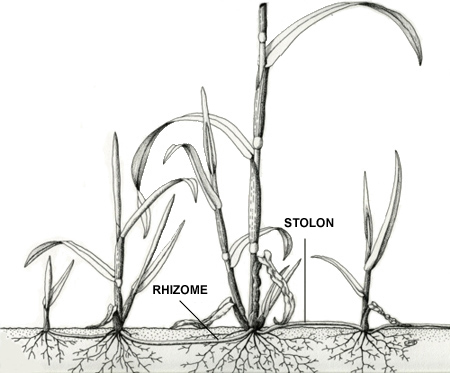 But I thought rhizomes were under ground and stolons above ground (and along the surface, not high up like this)? And googling I find only one palm, Chamaedorea stolonifera (the "Stolon palm") with stolons. Other than that the only palm I find with above soil branching is Hyphaene thebaica but that doesn't look like stolons. Some palm trees have rhizomes but I haven't read about Lipsticks having it. Also Syagrus spp can form stolons: S campylospatha, S petraea (Noblick 2017). I would propose that you open a new thread on the other forum with a title like Palms Producing Stolons or so and ask for other photos. Thanks Pal. It will be interesting to see where it ends up. The way it's pointed right now, it will hit the inside of the pot. I kinda hope it does. Wouldn't know what to do with it if it starts crawling far away.. Except maybe the idea of putting a new, small pot next to it, maybe I would then get one more palm, and could cut the stolon eventually? 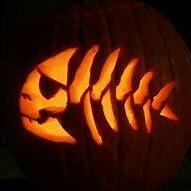 Thanks but it is headed just inside the brim. Can't see how I can fit a bag there then. But maybe it will start crawling along the brim, maybe I can change its direction a bit then. Have a larger one also indoors and it's pretty speedy in it's growth. I keep mind in a larger tub of warm water. The rest is growing fast as well. I stopped counting stems at 16 in June and it's added some since then. And now two fronds hit the ceiling. By 3 months I will have to remove the stool to make room for higher fronds which means I have to add one more CMH spot to cover lower leaves.. 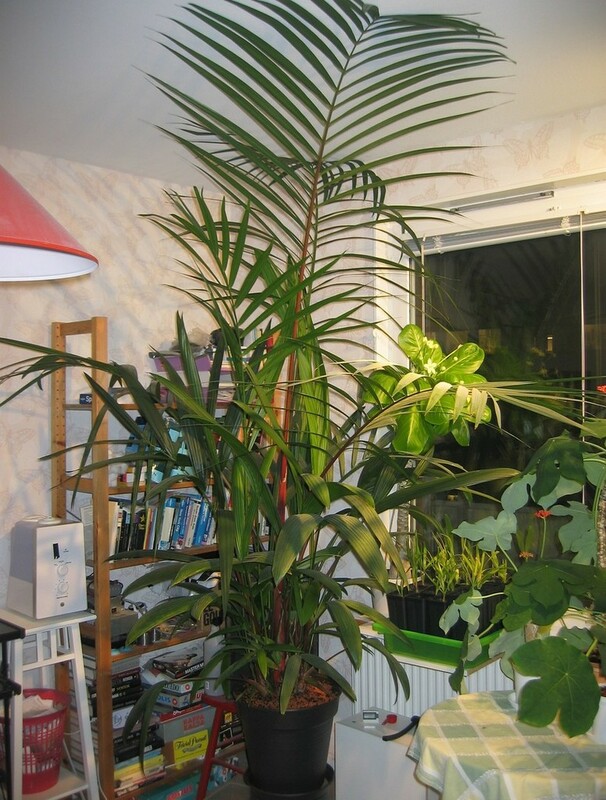 I have issues with other palms (like the Coccothrinax seedlings you can see in the window but hopefully they are allright now) but this one grows like crazy. It is not perfect, some yellow pale areas here and there and some small brown tips but nothing that looks bad. I do worry about the soil for the future, it is mostly peat and so far it loves it and it drains fast (due to roots penetrrating it so well I think) but I'm thinking eventually I might have to exchange soil either due to peat being unsuitable (too wet) when pot gets even bigger or peat getting old and I fear it might hate that plus getting heavy. So far no problems with the soil though and maybe it will keep good texture due to the root system penetrating so well. It's funny how fast it penetrates the soil but without causing soil to become really compact and without circling the bottom or even sticking out. 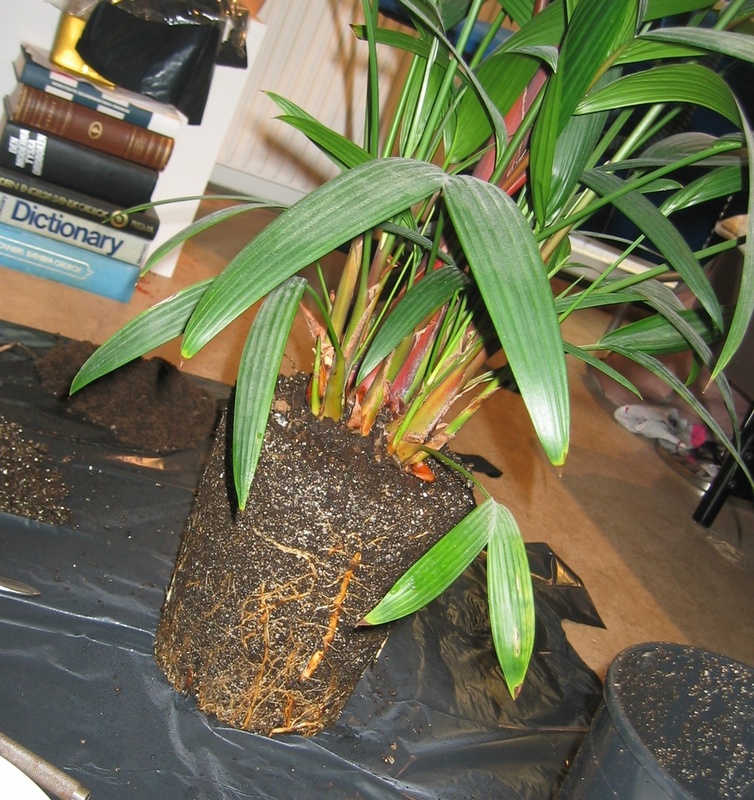 Really easy to get out of the pot unlike other palms which cling to the drainage holes after a few weeks. I call it the "stolon bridge"
IS that a stolon or a sucker? One can't argue with your success. I would give it a much bigger pot. Crytostachys love growing as emergent swamp plants in standing water, so there's no way that you could overwater the plant. 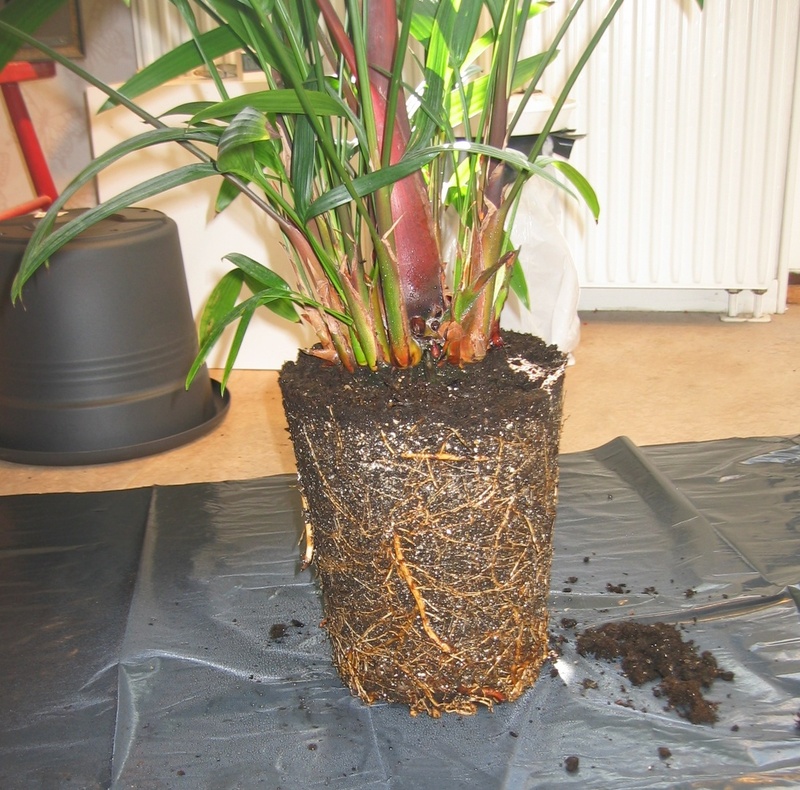 If the soil (or soil + water) temperature could be maintained at 26 C or above the palm would be really happy. Admittedly, it looks pretty happy right now! 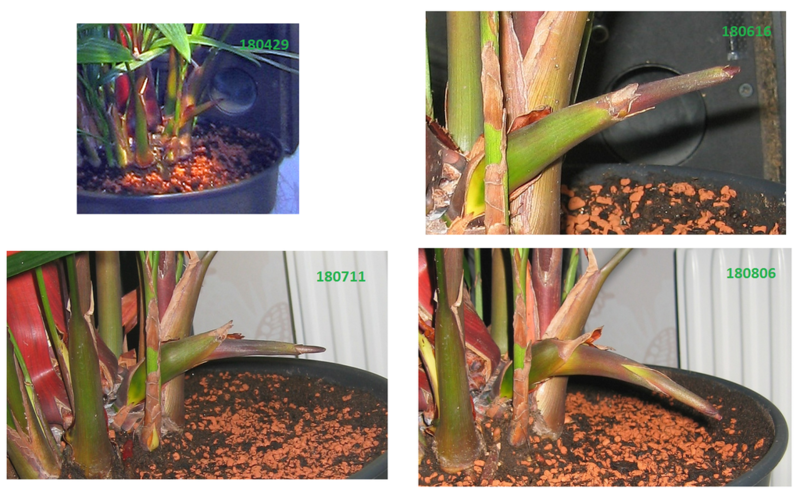 I would propose that you = @David_Sweden open a new thread on the other forum with a title like Palms Producing Stolons or so and ask for other photos. Would look better in a bigger apartment though, or a house, maybe should make some babies so that we get an excuse to move..
Green babies are a good enough excuse! @Cancundude, since you mentioned you've been looking around at other posts, I'm sure you've seen this post. Tagging you in case you haven't. Beautifully grown indoors!